Plume-generated large igneous provinces (LIP) are considered to have fragmented supercontinents, breaking them up into their constituent continents that are now far apart and separated by newly created ocean floor. One of the best examples of such continental fragmentation is perhaps the break up of the Gondwanan supercontinent into Africa, Australia, Antarctica and India in and around the new Indian sea floor. This fragmentation was caused by the action of three major plumes, and their associated LIPs, remnants of which are the Marion, Kerguelen and Reunion hotspots of the Indian Ocean. In a recently published paper (Ghatak and Basu, 2011), we have determined the isotopic and geochemical signatures for the Sylhet traps in the northeastern corner of the Indian subcontinent, and linked them to the large volumes of basalt that erupted in the early Cretaceous in the eastern Indian continental margin (ca. 118 Ma Rajmahal and Bengal traps), southwestern Australia (130 Ma Bunbury basalts) and Antarctica (114 Ma lamprophyres). All this ca. 130 -118 Ma magmatism is linked to the Kerguelen plume that also created the 82 to 38 Ma from North to South Ninetyeast Ridge (NER), 94 – 95 Ma Broken Ridge, and 118-110 Ma Naturaliste and Kerguelen Plateaus in the southern Indian Ocean (Fig. 1, e.g. Frey et al., 1996; Frey et al., 2009; Weis and Frey, 1991). Based on the voluminous basaltic magmatism and its high 3He signature, the Kerguelen event is considered to belong to the same group of lower-mantle-sourced hotspots as Hawaii, Iceland and Reunion (Doucet et al., 2006; Ingle et al., 2004; Basu et al., 1993). 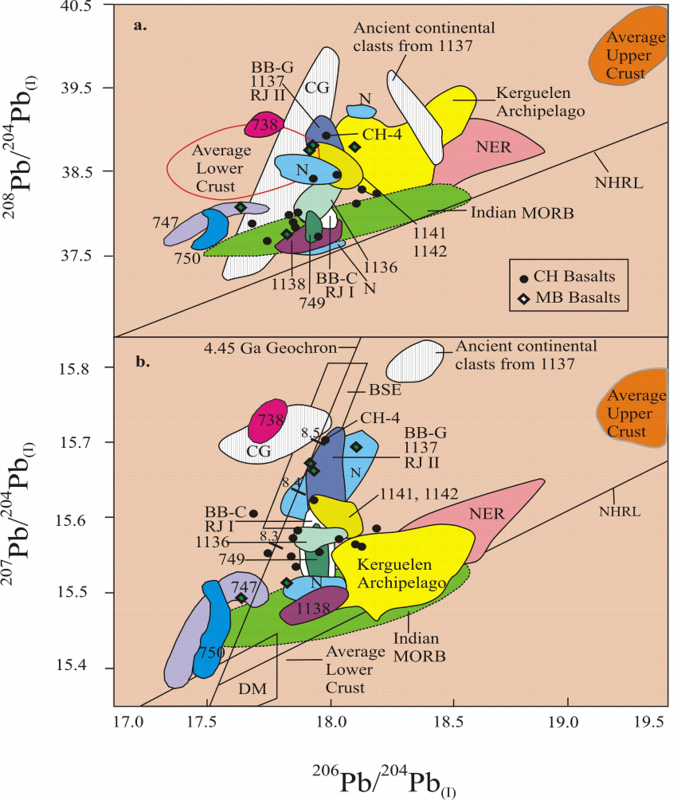 Earlier studies on geochronology, geochemistry and plate reconstructions suggested the flood basalt provinces of eastern India, constituting the Rajmahal-Sylhet-Bengal traps of 116±3.5 Ma age (Fig. 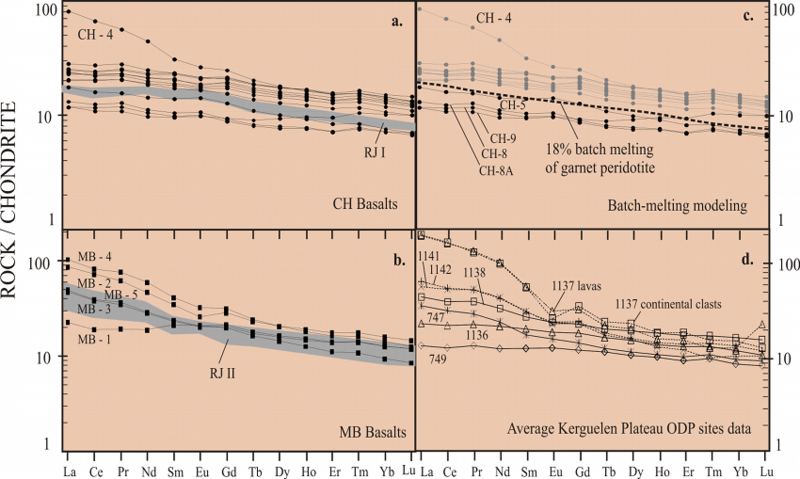 1b, Basu et al., 2001; Baksi, 1995; Ghatak and Basu, 2006; Pantalu et al., 1992) to be related to an early episode of Kerguelen volcanism. These results contra-indicated the older model (e.g., Curray and Munasinghe, 1991), that suggested that the Rajmahal volcanism was related to the Crozet hotspot via the Eightyfive East Ridge. In addition, several other geochemical studies in the 1980’s and late 1990’s postulated that the Rajmahal basalts were examples of volcanism associated with hotspot activities that were derived from compositionally normal asthenosphere. In our recent study (Ghatak and Basu, 2011), we focused on the detailed geochemical and isotopic data of the Sylhet traps. Specifically, we have documented geochemical similarity of the Sylhet traps with Rajmahal lavas (Kent et al., 1997), Bunbury-Casuarina basalts (Frey et al., 1996) and basalts from several Ocean Drilling Program (ODP) sites (e.g. Ingle et al., 2002b; Neal et al., 2002). Drill core data and samples of the Bengal basin lowlands (Fig 1b; Sengupta, 1966) indicate the continuity of the Bengal traps beneath the Gangetic – Brahmaputra alluvium of the basin. 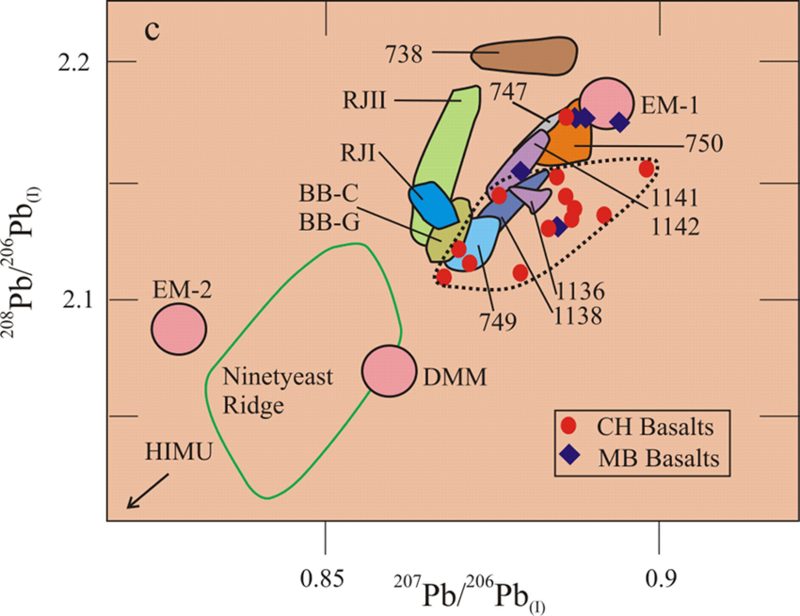 It is of interest that the oldest 81 Ma part of the Ninetyeast Ridge at 10°N is much younger than the Rajmahal-Bengal-Sylhet Traps (Duncan, 1978). By northward extrapolation along the NER beneath the Bengal Fan in the Bay of Bengal, it is indicative that the Rajmahal-Bengal-Sylhet traps with their peripheral alkalic volcanism (Fig 1b) constitute at least a 800 km diameter plume head. The diameter is inferred to be even larger when the lavas of similar age from the Naturaliste and Kerguelen Plateaus are included. It is intriguing that a recent study (Zhu et al., 2009) suggested that the 132 Ma activity of the Kerguelen plume in Bunbury, southwest Australia is linked with the Comei Volcanic Province of same age in southeastern Tibet, just south of the Indus-Tsangpo suture. Although this age is 12 Ma older than the ~ 120 Ma activity of the southern and central part of the Kerguelen Plateau and of the Rajmahal-Bengal Sylhet traps, the plate reconstructions of this region in the early Cretaceous allow the 132 Ma Comei – Bunbury reconstruction and suggest a far larger expanse of this early (precursor?) Kerguelen plume activity. Our recently published (Ghatak and Basu, 2011) results of the Sylhet Traps add credence to the plate tectonic reconstruction of the Indian Subcontinent since the early Cretaceous, framed by two large plume heads (and associated LIPs), the Deccan and the Rajmahal-Bengal-Sylhet provinces, and two corresponding aseismic plume tails, the Maldive-Lakshadweep and the Ninetyeast Ridges linked with the Reunion and Kerguelen plumes, respectively. Figure 1a: Map of part of the Indian Ocean and surrounding continents with physiographic features, after Ingle et al. (2002b), Frey et al. (2000 a,b) and (Ghatak and Basu, 2011), showing locations of the Sylhet and Rajmahal Traps in northeastern India. Also shown in gray is the extended Eastern Ghats – Shillong orogenic belt (Yin et al., 2010) along the east coast of India. Basalt provinces attributed to the Kerguelen plume (Frey et al., 2002) include Kerguelen Plateau, Broken Ridge, Ninetyeast Ridge, Bunbury basalts and Rajmahal Traps. Abbreviations used: BB – Bunbury Basalt drill core sites; NKP – North Kerguelen Plateau; CKP – Central Kerguelen Plateau; SKP – South Kerguelen Plateau; CG – Chilka Granulites (Chakrabarti et al., 2011). Black crosses are ODP sites. Sites 253, 254, 756, 757, 214, 216, and 758 are from the Ninetyeast Ridge and are grouped as NER in subsequent Nd-Sr-Pb isotopic plots. Figure 1b: Geological map showing structural features and locations of the Rajmahal and Sylhet Traps in and around the Bengal Basin including bore hole sites, some of which encountered Rajmahal-age basalts (Sengupta, 1966), and the alkalic-ultrabasic rocks of Samchampi, Sung, Sikkim, and Bokaro also thought to be related to the Rajmahal-Sylhet Traps. Legend for map is in the lower right hand column. Volcanic stratigraphy of lava samples with corresponding flow and sample numbers from the CH and MB sections of the Sylhet Traps analyzed in our recent Ghatak and Basu, 2011 study is in the lower left column. Figure 2: Chondrite-normalized REE patterns of basalts analyzed from the two sections exposed in the Sylhet Traps, after Ghatak and Basu (2011): (a) CH lavas and (b) MB lavas. Sample numbers correspond to the lava flows in figure 2b. (c) Modeling result shown by the dotted line, of 18% batch melting of a garnet lherzolites source. Details of batch melting are shown in Supplementary text S2. (d) Average REE patterns from various Kerguelen Plateau ODP sites (Frey et al., 2000; Frey et al., 2002; Ingle et al., 2002a; Neal et al., 2002), and continental clasts from Site 1137 (Ingle et al., 2002a) are shown for comparison. 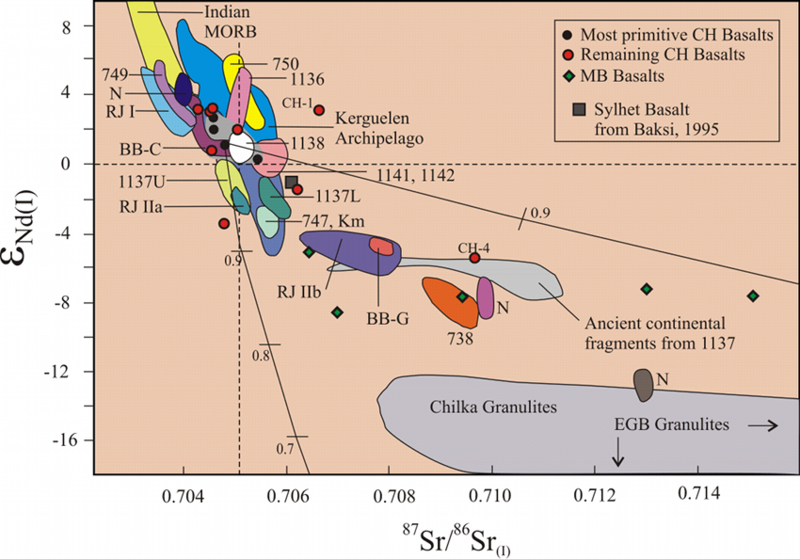 Figure 3: Primitive mantle normalized element ratio plots with some possible end-member compositions that may have been involved in the formation of the Sylhet-Rajmahal and Kerguelen provinces, after Ghatak and Basu (2011). Abbreviations: LC – lower crust, UC – upper crust, LM – lithospheric mantle. Data sources: sites 1141, 1142 (Mahoney et al., 1995); site 738 (Alibert, 1991; Mahoney et al., 1995); Sites 747, 749, 750 (Storey et al., 1992; Frey et al., 2000a); Site 1138 (Neal et al., 2002); Bunbury basalts (Storey et al., 1992; Frey et al., 1996); Rajmahal Traps (Kent et al., 1997); average continental crust estimates (Weaver and Tarney, 1984; Rudnick and Fountain, 1995); E-MORB (Mahoney et al., 2002); other primitive mantle values (Sun and McDonough, 1989). Figure 4: (a) 208Pb/204Pb(I) vs. 206Pb/204Pb(I); (b) 207Pb/204Pb(I) vs. 206Pb/204Pb(I); and (c) 207Pb/206Pb(I) vs. 208Pb/206Pb(I) plots, after Ghatak and Basu (2011), for the CH and MB section basalts of the Sylhet Traps at the 117 Ma age of eruption compared with South and Central Kerguelen Plateau basalts, Bunbury Basalts, Naturaliste Plateau lavas, Rajmahal Traps, NER, CG,.BSE, NHRL,, DM, and upper and lower continental crust. μ values of 8.3, 8.4, and 8.5 are shown in (b) where μ = 238U/204Pb. The field of ancient continental crustal clasts at ODP Site 1137 (Ingle et al., 2002a) uses present day values. The field of Indian MORB includes the Southeast Indian Ridge (Mahoney et al., 2002). In (c) mantle reservoirs EM-I, EM-II, DMM, and HIMU from Saal et al. (1998). The dotted line encloses most of the CH section lavas of the Sylhet Traps that are far removed from EM-2, NER and DMM. Abbreviations: NER – Ninetyeast Ridge; BB-C – Bunbury, Casuarina; BB-G – Bunbury, Gosselin; N – Naturaliste Plateau; RJ I – Rajmahal Traps Group I; RJ II – Rajmahal Traps Group II; CG – Chilka Granulites; BSE – bulk silicate Earth; NHRL – Northern Hemispheric Reference Line; DM, DMM – Depleted mantle. Data sources: Indian MORB (Mahoney et al., 1992; Weis and Frey, 1996); NER (Weis et al., 1991); Bunbury (Frey et al., 1996); Rajmahal basalts (Kent et al., 1997); South and Central Kerguelen Plateau sites 738, 749, 750, 747, 1138 (Mahoney et al., 1995; Frey et al., 2000a; Frey et al., 2002; Neal et al., 2002); Elan Bank 1137, and ancient continental fragment from 1137 (Ingle et al., 2002a); Kerguelen Archipelago (Mahoney et al., 1996; Weis et al., 1998; Frey et al., 2000b; Weis et al., 2002a,b); Chilka Granulites (Chakrabarti et al., 2011); NHRL (Hart, 1984); DM (Hart and Zindler, 1989); and upper and lower continental crust (Zartman and Doe, 1981). Figure 5: (a) Initial εNdvs. 206Pb/204Pb(I) and (b) 87Sr/86Sr(I) vs. 206Pb/204Pb(I) for the Sylhet basalts compared with Indian MORB, including Southeast Indian Ridge (Mahoney et al., 2002), Bunbury basalts, Rajmahal basalts, Kerguelen Plateau basalts, possible crustal contaminants, Chilka Granulites (CG), ancient continental clasts from ODP Sites 1137, and 738 (Alibert, 1991; Mahoney et al., 1995). Group II kimberlite (Km) related to the Rajmahal flood basalt province (Kumar et al., 2003) is also shown. Other data sources as in figure 4, after Ghatak and Basu (2011). 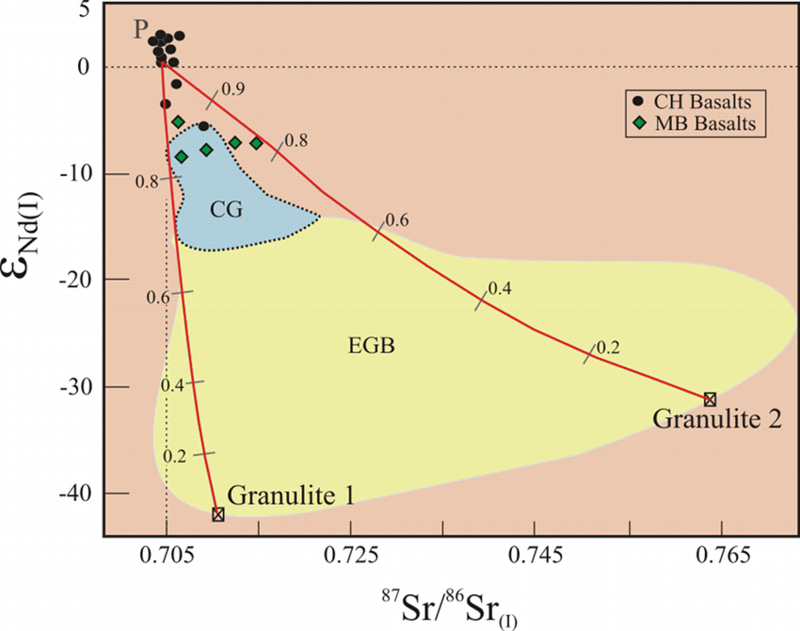 Figure 6: Plot of εNd(I) versus Ce/Pb, for CH basalts, after Ghatak and Basu (2011) with modeled mixing lines between continental crust (CC), depleted mantle (DMM), Southeast Indian Ocean E-MORB, Early Differentiated Earth (EDR), and bulk silicate Earth (BE). Mixing lines are modeled using mixing equations of DePaolo 1988. Data sources: CC (Taylor and McLennan, 1995); DMM (Salters and Stracke, 2004); Southeast Indian Ocean E-MORB (Mahoney et al., 2002); EDR (Boyet and Carlson, 2006); BSE (Miller et al., 1994). Ratios are as follows: Ce/Pb;DMM, E-MORB = 25; EDR, BE = 10; CC = 4. εNd: DMM = 10, E-MORB = 7, EDR = 4.9, BE = 0 and CC = -15. Figure 7b: Initial εNd and 87Sr/86Sr isotopic ratios of the Sylhet Traps shown with massif Chilka anorthosite-granulites, CG (Chakrabarti et al., 2011) as well as enderbites (mafic granulites), all from the Eastern Ghats Belt (EGB) of India (Rickers et al., 2001). Two mixing curves are shown resulting from modeling a common end member P, the most primitive CH lavas, and granulites 1 and 2 from the EGB, considered as the second end members. This modeling indicates 0-10% contamination for most of the Sylhet lavas by the EGB granulites. Figure after Ghatak and Basu (2011). Alibert, C., 1991. Mineralogy and geochemistry of a basalt from Leg 119, Site 738: implications for the tectonic history of the most southern part of the Kerguelen Plateau. In: Barron, J., Larsen, B. (Eds. ), Proceedings of the Ocean Drilling Program: Scientific Results, 119. College Station, TX, pp. 293–298. Baksi, A.K., Barman, T.R., Raul, D.K., Farrar, E., 1987. Widespread early Cretaceous flood basalt volcanism in eastern India: geochemical data from the Rajmahal–Bengal–Sylhet Traps. Chemical Geology 63, 133–141. Baksi, A.K., 1995. Petrogenesis and timing of volcanism in the Rajmahal flood basalt province, northeast India. Chemical Geology 121, 73–90. Basu, A.R., Renne, P.R., DasGupta, D.K., Teichmann, F., Poreda, R.J., 1993. Early and late alkali igneous pulses and a high-3He plume origin for the Deccan flood basalts. Science 261, 902–906. Basu, A.R., Weaver, K.L., Sengupta, S., 2001. A plume head and tail in the Bengal basin and Bay of Bengal: Rajmahal and Sylhet Traps with surrounding alkalic volcanism and the Ninetyeast Ridge. EOS Transactions, American Geophyical Union v. p.V12A-0950. Boyet, M., Carlson, R.W., 2006. A new geochemical model for the Earth's mantle inferred from 146Sm−142Nd systematics. Earth and Planetary Science Letters 250, 254–268. Chakrabarti, R., Basu, A.R., Bandyopadhyay, P.K., Zou, H., 2011. 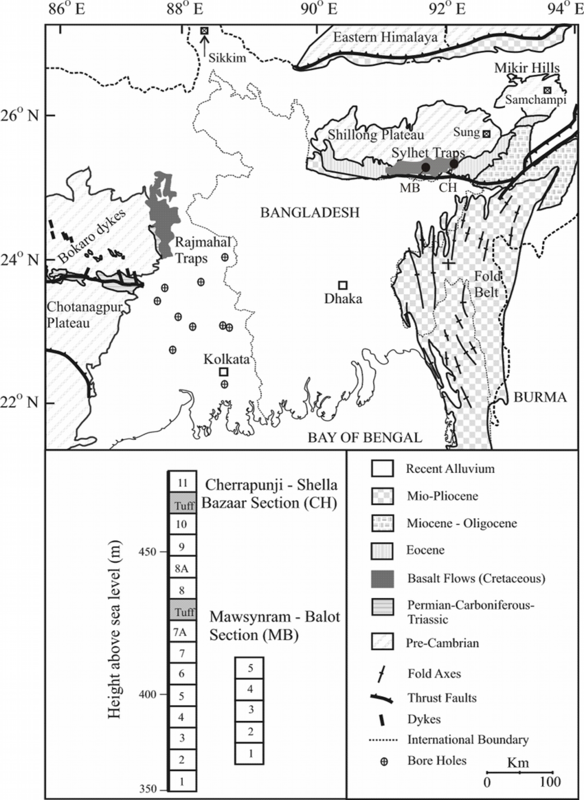 Age and origin of the Chilka Anorthosites, eastern Ghats, India: implications for Massif Anorthosite Petrogenesis and break-up of Rodinia. In: Ray, J.S., et al. (Ed. ), Topics in Igneous Petrology. Springer Science, pp. 355–382. Curray, J.R., Munasinghe, T., 1991. Origin of the Rajmahal Traps and the 85° E ridge: preliminary reconstructions of the trace of the Crozet hotspot. Geology 19, 1237–1240. Doucet, S., Moreira, M., Weis, D., Scoates, J.S., Giret, A., Allegre, C., 2006. Primitive neon and helium isotopic compositions of high-MgO basalts from the Kerguelen Archipelago. Indian Ocean: Earth and Planetary Science Letters 241, 65–79. Duncan, R.A., 1978. Geochronology of basalts from the Ninetyeast Ridge and continental dispersion in the eastern Indian Ocean. Journal of Volcanology and Geothermal Research 4, 283–305. Frey, F.A., McNaughton, N.J., Nelson, D.R., deLaeter, J.R., Duncan, R.A., 1996. Petrogenesis of the Bunbury basalt, Western Australia: interaction between the Kerguelen plume and Gondwana lithosphere? Earth and Planetary Science Letters 144, 163–183. Frey, F.A., Coffin, M.F., Wallace, P.J., Weis, D., Zhao, X., 2000a. Origin and evolution of a submarine large igneous province: the Kerguelen Plateau and Broken Ridge, southern Indian Ocean. Earth and Planetary Science Letters 176, 73–89. Frey, F.A., Weis, D., Yang, H.-J., Nicolaysen, K.E., Leyrit, H., Giret, A., 2000b. Temporal geochemical trends in Kerguelen Archipelago basalts: evidence for decreasing magma supply from the Kerguelen plume. Chemical Geology 164, 61–80. Frey, F.A., Weis, D., Borisova, A.Y., Xu, G., 2002. Involvement of continental crust in the formation of the Cretaceous Kerguelen Plateau: new perspectives from ODP leg 120 sites. Journal of Petrology 43, 1207–1239. Ghatak, A., Basu, A.R., 2006. Remnants of the Kerguelen plume in eastern India: evidence from Nd–Sr–Pb isotopic and trace element geochemistry of Sylhet Traps, Shillong Plateau. American Geophyical Union 87, 52. Ingle, S., Weis, D., Frey, F.A., 2002a. Indian continental crust recovered from Elan Bank, Kerguelen Plateau (ODP Leg 183, Site 1137). Journal of Petrology 43, 1241–1257. Ingle, S., Weis, D., Scoates, J.S., Frey, F.A., 2002b. Relationship between the early Kerguelen plume and continental flood basalts of the paleo-Eastern Gondwana margins. Earth and Planetary Science Letters 197, 35–50. Ingle, S., Scoates, J.S., Weis, D., Brugmann, G., Kent, R.W., 2004. Origin of Cretaceous continental tholeiites in southwestern Australia and eastern India: insights from He and Os isotopes. Chemical Geology 209, 83–106. Kent, R.W., Saunders, A.D., Kempton, P.D., Ghose, N.C. (Eds. ), 1997. Rajmahal basalts, eastern India: mantle sources and melt distribution at a volcanic rifted margin. Geophysical Monograph (AGU), Washington DC. 145–182 pp. Kumar, A., Dayal, A.M., Padmakumari, V.M., 2003. Kimberlite from Rajmahal magmatic province: Sr–Nd–Pb isotopic evidence for Kerguelen plume derived magmas. Geophys. Res. Lett. 30, 2053–2056. Mahoney, J.J., Macdougall, J.D., Lugmair, G.W., Gopalan, K., 1983. Kerguelen hotspot source for Rajmahal and Ninetyeast Ridge? Nature 303, 385–389. Mahoney, J.J., Jones, W.B., Frey, F.A., Salters, V.J.M., Pyle, D.G., Davies, H.L., 1995. 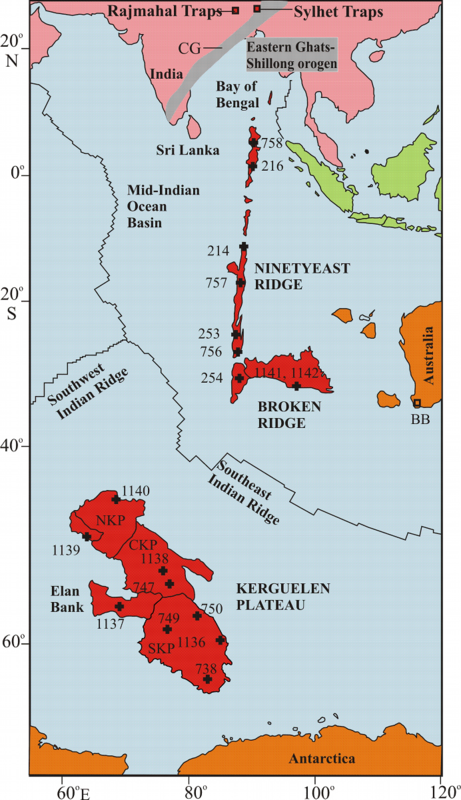 Geochemical characteristics of lavas from Broken Ridge, the Naturaliste Plateau and southernmost Kerguelen Plateau: Cretaceous plateau volcanism in the southeast Indian Ocean. Chemical Geology 120, 315–345. Neal, C.R., Mahoney, J.J., Chazey III, W.J., 2002. Mantle sources and the highly variable role of continental lithosphere in basalt petrogenesis of the Kerguelen Plateau and Broken Ridge LIP: results from ODP leg 183. Journal of Petrology 43, 1177–1205. Pantulu, G., Macdougall, J.D., Gopalan, K., Krishnamurthy, P., 1992. Isotopic and chemical compositions of Sylhet Traps basalts: links to the Rajmahal Traps and Kerguelen hotspot: American Geophysical Union. San Francisco 72, 328. Ray, J.S., Pattanayak, S.K., Pande, K., 2005. Rapid emplacement of the Kerguelen plumerelated Sylhet Traps, eastern India: evidence from 40Ar−39Ar geochronology. Geophys. Res. Lett. 32, 1–4. Rickers, K., Mezger, K., Raith, M.M., 2001. Evolution of the continental crust in the Proterozoic Eastern Ghats Belt, India and new constraints for Rodinia reconstruction: implications from Sm–Nd, Rb–Sr and Pb–Pb isotopes. Precambrian Research 112, 183–210. Sengupta, S., 1966. Geological and geophysical studies in western part of Bengal Basin India: Bulletin American Association of Petroleum Geology 50, 1001–1017. Storey, M., Kent, R.W., Saunders, A.D., Hergt, J., Salters, V.J.M., Whitechurch, H., Sevigny, J.H., Thirlwall, M.F., Leat, P., Ghose, N.C., Gifford, M., 1992. Lower Cretaceous volcanic rocks on continental margins and their relationship to the Kerguelen Plateaus. In: Wise, S.W., Schlich, R. (Eds. ), Proceedings of the Ocean Drilling Program. : Scientific Results, 120. Ocean Drilling Program, College Station, TX, pp. 33–53. Weis, D., Frey, F.A., 1991. Isotope geochemistry of the Ninety-east Ridge basalts: Sr, Nd, and Pb evidence for the involvement of the Kerguelen hotspot. In: Weissel, J., Peirce, J., Taylor, E., Alt, J. (Eds. ), Proceedings of the Ocean Drilling Program. : 121. College Station, TX, pp. 591–610. Weis, D., Frey, F.A., Leyrit, H., Gautier, I., 1993. Kerguelen Archipelago revisited: geochemical and isotopic study of the Southeast Province lavas. Earth and PlanetaryScience Letters, 118, 101–119. Weis, D., Frey, F.A., 1996. Role of the Kerguelen plume in generating the eastern Indian Ocean seafloor. Journal of Geophysical Research, 101, 13831–13849. Weis, D., Frey, F.A., Giret, A., Cantagrel, J.-M., 1998. Geochemical characteristics of the youngest volcano (Mount Ross) in the Kerguelen Archipelago; inferences for magma flux, lithosphere assimilation and composition of the Kerguelen plume. Journal of Petrology 39, 937–994. Weis, D., Frey, F.A., Schich, R., Schaming, M., Montigny, R., Damasceno, D., Mattielli, N., Nicolaysen, K.E., Scoates, J.S., 2002a. Trace of the Kerguelen mantle plume: evidence from seamounts between the Kerguelen Archipelago and Heard Island, Indian Ocean. Geochemistry Geophysics Geosystems 3, 1–27. Weis, D., Frey, F.A., Schlich, R., Schaming, M., Montigny, R., Damasceno, D., Mattielli, N., Nicolaysen, K.E., Scoates, J.S., 2002b. Trace of the Kerguelen mantle plume: evidence from seamounts between the Kerguelen Archipelago and Heard Island. Indian Ocean: Geochemistry Geophysics Geosystems 3, 1033. Zhu, Di-Cheng, Chung, Sun-Lin, Mo, Xuan-Xue, Zhao, Zhi-Dan, Niu, YAoling, Song, Biao and Yang, Yue-Heng., 2009. 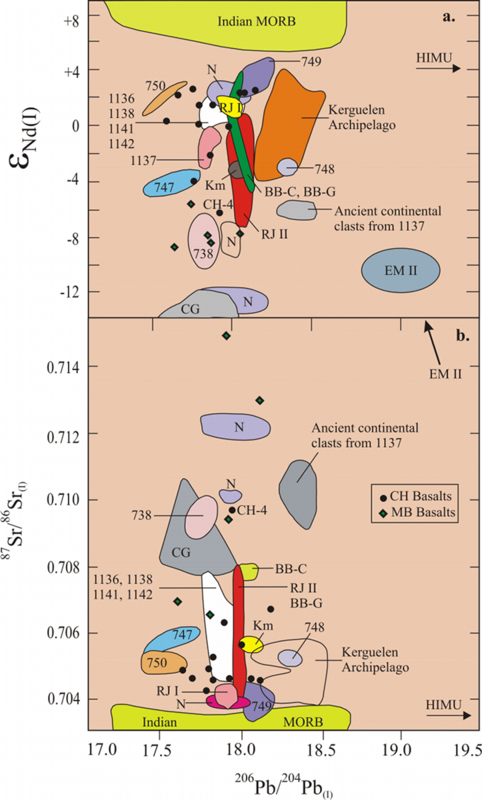 The 132 Ma Comei-Bunury large igneous provibce: remnants identified in present-day southeastern Tibet and southwestern Australia. Geology, 37, (7), 583-586.